Wall Street looks set for a sixth consecutive day of losses. 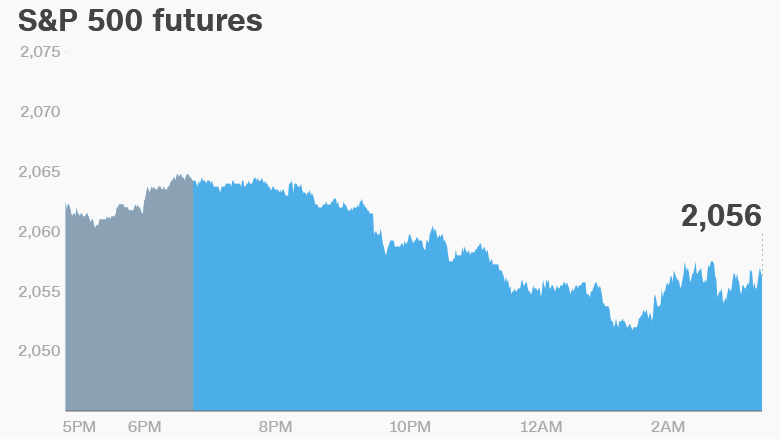 U.S. stock futures are pointing down. European markets are declining in early trading and Asian markets ended the day in negative territory. 1. Central banks take center stage: Investors are watching a flurry of central bank announcements from the U.S., Japan and Switzerland. The Bank of England is also set to make a policy announcement Thursday, with most investors expecting rates to be held steady. The Federal Reserve said Wednesday it would not raise interest rates and cut its forecast for U.S. economic growth in 2016 to 2%, down from 2.2%. Then the Bank of Japan refrained from announcing further stimulus measures for the economy, which caused the yen to surge. One dollar is now worth 104 yen, a high the Japanese currency has not seen since 2014. This pushed the benchmark Nikkei index down by 3%. The Swiss National Bank kept its interest rates steady and reiterated that the Swiss franc was overvalued. 2. Flight to safety: Uncertainty over the global economy, and the outcome of next week's EU referendum in the U.K., is prompting investors to protect their assets in safe-haven investments right now. That's pushing up the price of gold by 2% to about $1,310 per ounce. And bond prices in nations with solid credit ratings are spiking, pushing interest rates down. Yields on U.S. 10-year government bonds are now at their lowest level since 2012, and yields on German 10-year bonds are back in negative territory. Buyers of these assets are essentially taking a loss just to hold them. 3. Earnings: Kroger (KR) and Rite Aid (RAD) will post quarterly earnings updates ahead of the opening bell. After the close, investors will hear from Oracle (ORCL) and gun maker Smith & Wesson (SWHC). Investors will be waiting to see if Smith & Wesson executives say anything about an increase in demand for guns following the Orlando massacre. Gun sales in the U.S. tend to spike after high-profile shootings as people worry that stricter gun control laws could follow. 4. Economics: The U.S. Bureau of Labor Statistics will post its latest inflation data for May at 8:30 a.m. ET, following the release of monthly inflation data from the 18-member eurozone. Also at 8:30 a.m., the U.S. Department of Labor will post weekly jobless claims data. 5. Brexit vote in one week: The upcoming U.K. "Brexit" referendum is still at the top of traders' minds. The British public is set to decide on June 23 whether the country should leave the European Union. Many experts and world leaders have predicted that a vote to leave would hurt trade and investment, trigger a recession, kill jobs, slam the pound and cause house prices to fall. But so-called "Brexiteers" predict that leaving the bloc of 28 member nations could ultimately boost the economy and allow the country's leaders to make their own regulations without meddling from outsiders. Related: Can you pass the Brexit test? 6. Market recap: U.S. stocks have fallen for five straight trading days. The Dow Jones industrial average has lost 2% over this period. The S&P 500 has sunk by 2.3%. The Nasdaq has suffered even more, dropping by 2.8%.